I received a beautiful chunk of pumpkin from my sister in law's garden (she lives next door and of course grows everything organic). It was enough to make 3 pumpkin pie filling, and then another excess of an extra half a cup. So I decided to freeze enough for making "only" 2 pumpkin pies. 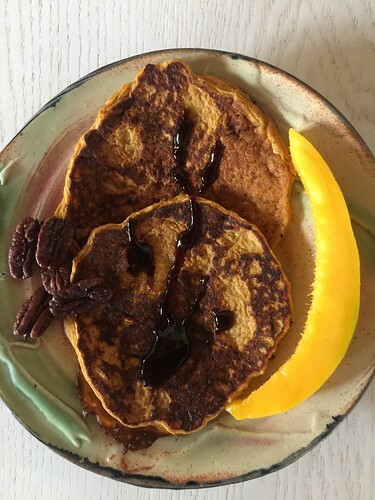 From the remaining pumpkin puree, I created this yummy breakfast pancakes today. Try to say "Pumpkin pancakes" and you'll quickly realize that's a pretty difficult thing to do. So I decided to just call them pumpkakes! Add flour mixture to the pumpkin mixture. Fry one table spoon pancakes on a hot and buttered girdle until the rims of the pancake are a bit dry, and only then flip (this is a pretty soft. Serve with date molasses, maple syrup or honey and various orange fruits such as mango, persimmon or sliced oranges.